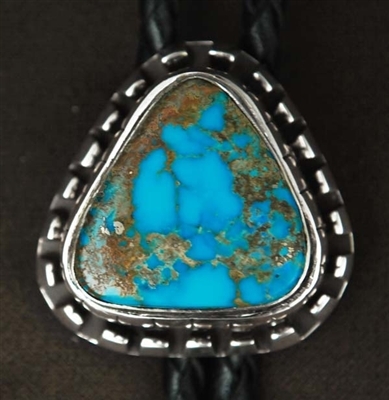 Isleta artist Ted Chraveze was known worldwide for his excellence in crafting distinctive one-of-a-kind, exquisite pieces of fine jewelry in silver, gold, precious and semi precious stones. His company was called "Dreams and Visions." He moved to Scottsdale, Arizona to study under world famous European jeweler, Pierre Touraine. He was one of only a few students who graduated from the Gemology Institute of America Diamond Course taught by Mr. Touraine. Ted along with his daughter designed a line of Ferrari jewelry and received commissions from the Queen of Denmark, the Princess of Luxembourg, Cartia and more. 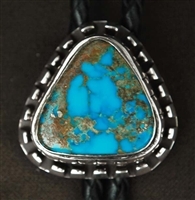 This wonderful bolo tie set with a beautiful, natural gem grade Morenci turquoise stone, offers a perfect example of Ted's work. A beautiful silver design features a double bezel that sets the stone up high, with a lovely heavy silver outer frame. The bolo measures 1 3/8" long by 1 3/8" wide. 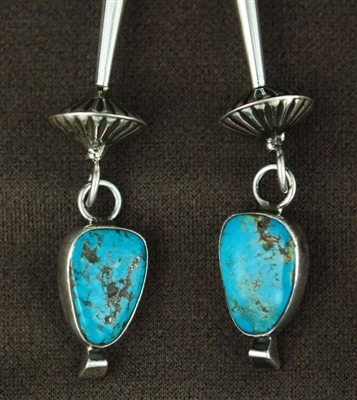 The bolo tips feature 7/8" long, Morenci turquoise. 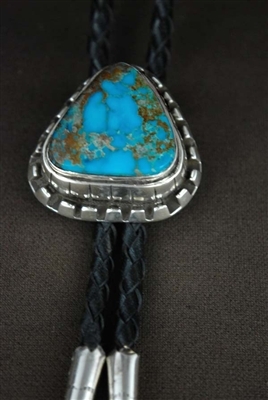 A black braided leather accompanies the bolo. 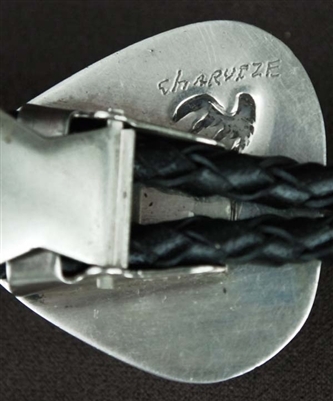 The bolo is hallmarked and also his etched Charveze.